I found an old coin in the oddest of places at the oddest of times. I was working with my litter abatement crew close to lunchtime in one of the more impoverished neighborhoods in our area–not impoverished enough to be dangerous, but not affluent enough to warrant well-manicured landscaping. We were picking up cigarette butts and bits of candy wrappers, almost at the end of the job, when I saw something circular and flat in the dirt. My first thought was to move on, leaving it there. It was encrusted with dirt and grime and who-knows-what-else, and after an hour on litter abatement there is very little I feel like picking up off the ground for any reason other than to toss it in the trash. Even wearing gloves, my hands feel contaminated. To pick up something nice with those gloves? And then to put it in my pocket? Doesn’t happen. But one of my crew was attracted to, well, almost anything–shiny things and coins in particular. Even though this wasn’t shiny, there was always the chance that he’d pocket it. No one is happy when he comes home with random things in his pockets. So I picked it up, quietly, while he was occupied with something else. I couldn’t tell what it was, but it seemed about the size of a 50 cent piece and I could see the date: 1914. 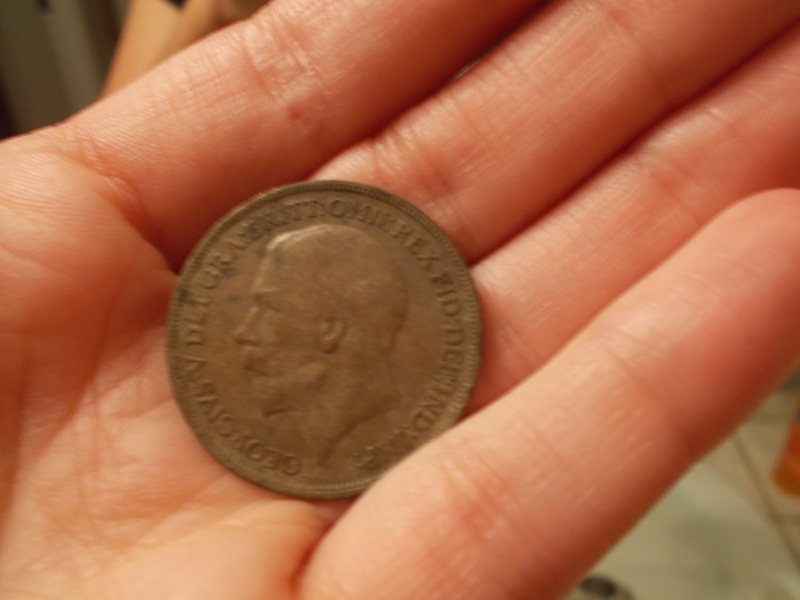 Once I got home, I did some research and discovered that what I found is a 1914 British penny. There’s a lot of cool information at that link, but the long and short of it is that there were about 51 million of them made so they’re not terribly rare and not terribly valuable. But the question remains: what was a World War I-era British coin doing at the corner of a mini-mart parking lot in a disadvantaged part of town? Was this part of a homeless person’s collection, a reminder of better days and treasured hobbies? Was this a fairly worthless gift to a young child who viewed it as an exotic treasure before he or she accidentally dropped it on the way to buy candy? Did it accidentally make it into someone’s change jar, only to be discarded on the street when it was discovered (since British pennies don’t really buy anything here)? What kind of stories can you come up with that involve the historical aspects of money? This entry was posted in Stories, Writing Prompt and tagged My Life Will Someday Be a Mind-Blowing Memoir, Now For Some Inspiration..., Things to Write About Some Day by Rommie. Bookmark the permalink.